Login to the SQL Server 2012 with the highest privileged account. 1. On the Start menu, point to All Programs, point to Microsoft SQL Server Code-Named 2012, point to Configuration Tools, and then click SQL Server Configuration Manager. 7. 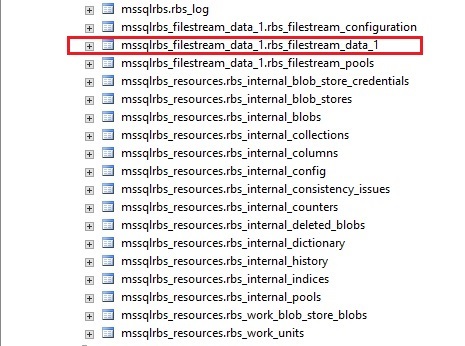 If you want to read and write FILESTREAM data from Windows, click Enable FILESTREAM for file I/O streaming access. Enter the name of the Windows share in the Windows Share Name box [In this case it was BLOBSTORE]. 8. Uncheck the Allow remote client’s access to FILESTREAM data. Click Apply. 9. In SQL Server Management Studio, click New Query to display the Query Editor. 12. Restart the SQL Server service. · The user account provisioning RBS stores must be a member of the db_owner fixed database role on each database that you are configuring RBS for. · For best performance, simplified troubleshooting, and as a general best practice, we recommend that you create the BLOB store on a volume that does not contain the operating system, paging files, database data, log files, or the tempdb file. 1. Click Start, click All Programs, click Microsoft SQL Server 2012, and then click SQL Server Management Studio. 2. Connect to the instance of SQL Server that hosts the content database. 4. Click the content database[DB1_RBSExp] for which you want to create a BLOB store, and then click New Query. 5. Paste the following SQL queries in Query pane, and then execute them in the sequence listed. 6. Blob folder was created in E:\BlobStore. 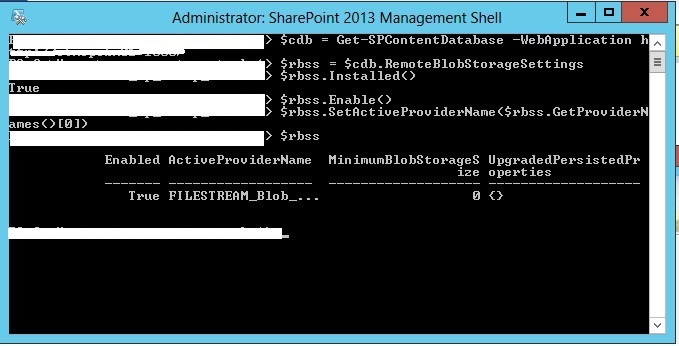 RBS client library should be installed on all servers in the SharePoint farm. The RBS client library is installed only one time per web server, but RBS is configured separately for each associated content database. The client library consists of a client-side dynamic link library (DLL) that is linked into a user application, and a set of stored procedures that are installed on SQL Server. Do not install the RBS client library by running the RBS.msi file and starting the Install SQL Remote BLOB Storage wizard. The wizard sets certain default values that are not recommended for SharePoint 2013. 3. Click Start, click Run, type cmd into the Run text box, and then click OK. Browse to C:\RBSClient\. 5. After this step verify that the RBS component is installed on the server by going to Control Panel. 1. Login to the other servers (WebServers and AppServers) in the farm servers as domain\sp_setup . 3. Click Start, click Run, type cmd into the Run text box, and then click OK. Product: SQL Remote Blob Storage – Installation completed successfully. 2. On the computer that is running SQL Server 2012, verify that the RBS tables were created in the content database. Several tables should be listed under the content database[DB1_RBSExp] that have names that are preceded by the letters "mssqlrbs". Note - The user account enabling RBS must have sufficient permissions to run Windows PowerShell. Executing $rbss.Installed() should return true, if false this may be due to the reason that RBS is not installed properly or RBS is not installed on other Web servers. 3. Type $rbss and verify that ActiveProviderName is not Null. See below. 1. Open the Site Collection where blob store is enabled. 2. Open a library or list where we can upload documents. Upload a document whose size limit is more than 100 KB. 3. 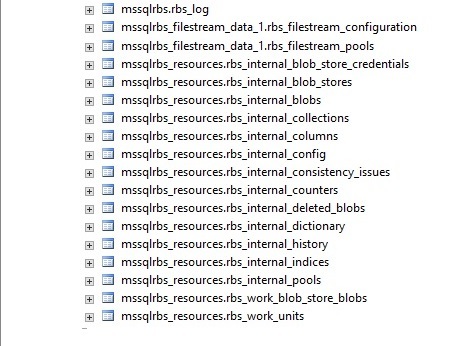 Browse to Blob Store Folder on the SQL server and verify the latest modified folder. The document should be present in it. · The SharePoint Set up account (domain\sp_setup) was made as sysadmin before running the RBS.msi. After uploading the first document to your RBS Enabled Site collection, this is what you see in your content database tables.